Morning sun comes through the trees up in the Peak 7, Breckenridge, CO neighborhood well before it hits the Blue Rive Valley below. From any of the Peak 7 homes for sale, trails into the national forest are just steps away and the chance of seeing wildlife or the stars at night are good. Peak 7 subdivisions appeals to home buyers who want more space for their money, who want long-term neighbors, a forest out the back door, a natural unpretentious setting, and easy access to the Breckenridge Ski Resort and Highway 9. Peak 7 real estate is on the flanks of the Tenmile Range at an altitude of about 10,000 feet, slightly lower than the peaks and the nearby Peaks Trail, which traverses the Tenmile Range from Frisco to the Breckenridge Ski Resort. The neighborhood is on the north side of downtown, and is where many year-round families live because the drive is more convenient for commuting to Frisco, Copper Mountain, Keystone or Vail. The first homes in the Peak 7 neighborhood were built in 1960 before there was a ski resort on the peaks above Breckenridge. Since then, nearly 90 percent of the lots have been developed. Styles in this neighborhood are eclectic: from log cabins and A-frames to an incredibly modern home worthy of attention from Architectural Digest. In contract to the man-made difference, all of Peak 7 homes share the feeling of being at home in the woods, which is increased by a lack of fences and lots of trees. Originally well and septic were the norm, but town water and sewer are now available in most of Peak 7, and required for new construction. The roads are maintained by Summit County, as none of this neighborhood lies within town boundaries. Size: single-family: 626 sq. ft. to 6710 sq. ft. Amenities: trail access, north side of Breckenridge, near Peak 7 and 8 base areas. Close to town, near Cucumber Creek. Peak 7 is located on the northwest side of Breckenridge, a mile north of the Peak 8 base area of the Breckenridge Ski Resort. From the traffic circle, drive north about 1 mile to Coyne Valley Road (CR3) and turn west (left). After a quarter mile jog left then right onto Barton Road. Ahead is the beginning of the Peak 7 neighborhood. When this road forks (about .5 mile) the left leads to subdivisions called Shadows, Prospector, Blue Ridge, Ridge Crest. 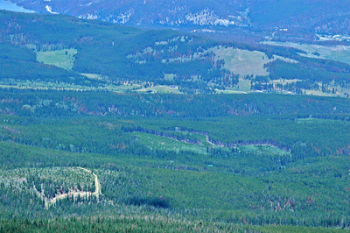 The right tine of the fork goes to Winterwood, American and Upper Slope subdivisions, but the roads ultimately join at the national forest border making a long loop. Stay ahead of the game and get in touch with an expert now! You can contact us online and someone will be in touch with you as soon as possible.